Pleeeeeease STOP hurting the cat! Can you hear my desperation? Yes! I’ve been there – the HITTING stage. Her friends, me, the dog – my daughter has hit, squeezed and scratched them all. And, I have had to put on my detective goggles to determine the cause and the best solution for her willy-nilly ways. Sometimes it was developmental – she was just too young to “remember” the rule or stop her impulses. Sometimes it was stress – she was holding a backlog of emotions and fears about the changes that were happening. Sometimes it was sensory – she needed to release the tension in her body. And, sometimes it was relational – she needed me to take an honest look at my own behavior and then choose to emotionally reconnect with her. 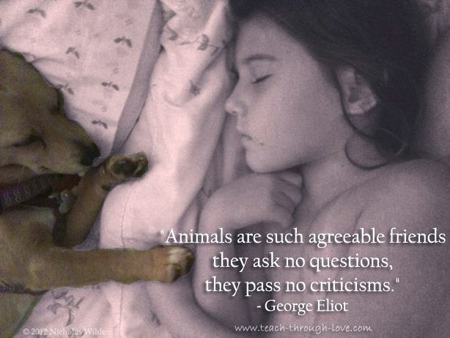 Children and animal cruelty is a topic that can strike fear into the heart of any parent. But, try not to be too alarmed – it is a VERY TYPICAL behavior for young children to display when curious, playful, angry or frustrated and it is usually a passing phase – as long as it is met with consistency and kindness. Children need to be able to rely on your responses and experience them as safe – if you want to have any influence. Using fear or punitive force may very well have the opposite effect of what your are hoping for because it intensifies the emotions that you are trying to quell. I know how easy it is to get upset with a child who won’t stop sitting on the cat or grabbing the dog’s tail. If you can remember your long-term goals for your child and the short-term nature of this phase – your ability to self-regulate your reactions will be enhanced. And trust me, it will be your greatest asset. In this week’s TEACHable Moment I share my 4 Tips for Keeping the Kids AND Pets Safe. to change our emotional state and shift into connection. – you will find yourself not only surviving but THRIVING during this naturally aggressive stage of childhood! So tell me, does your child have pet-aggression issues? What have you done to help him calm the emotional storm? Leave me a comment below or on the No Spank Facebook page and share your story because you never know – your idea might just be the spark of change someone else was looking for. Reposted with permission. Lori Petro, BS Ed., is a Speaker, Advocate & Parent Educator. She founded TEACH through Love as a vehicle to help families heal the cycle abuse and trauma through the relationship-building tools of empathy, compassionate communication and peaceful conflict resolution. As an adult with Asperger’s, Lori understands the demands of parenting kids with special needs and believes that by building strong bonds, we can cross the bridge to understanding the behaviors and needs of all kids. Lori is a sought-after speaker who consults privately with clients, teaches online and shares her insights and information in her weekly TEACHable Moments videos. Connect with Lori on Twitter: @TEACHthruLove, Facebook, Blog, and Website: http://www.teach-through-love.com.